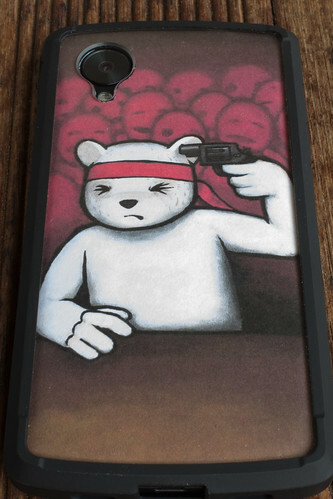 Forums › Android › nexus 5 cases? I have purchased a few from dx.com last week but I'll be lucky to see them before Christmas and I really hate having a smartphone not in a case. I called 2degrees and Warehouse Stationary. Neither have any cases and have no idea when they will be in stock. I was amazed that such a high profit item was not available on the release date. Someone should be fired for such a massive stuff up as most people will pay $40 for a 20cents item with out even blinking. So at this point I will just have to pray dealextreme get me the 5 I purchased before I bump, scratch or drop my phone. Ditto on Amazon availability but delivery is restricted to US (I know about YouShop but delivery costs would be at least twice the case value which is dumb). http://www.cbay.co.nz/ has spigens due any day, not cheap like dx or fast tech cheap but local. never bought anything from them, trademe feedback looks fine 60 negatives with 30000 positives. I buy my devices for a purposes and dont churn through them every 6 months so it's important that I keep it protected and looking good because if its a good purchase it may end up being used for 2-3 years. ie my last phone lasted 3 years and if it wasn't for its buttons now failing I'd still be using it. I have faith my Nexus 5 will provide me with at least 2-3 years of service if I look after it. Hell it comes with a 2 year warranty so I'd expect it to match the 3 years my iphone lasted. Well I pick up my 5 tomorrow so I am actually ......( I was going to say excited but that doesn't sound very cool does it ) keen...(that will do) to see how it goes! My daughter is in the uk at present I wonder if I will get her to send me one? gnfb: Well I pick up my 5 tomorrow so I am actually ......( I was going to say excited but that doesn't sound very cool does it ) keen...(that will do) to see how it goes! You will love the phone. I came from an iPhone 4 which I loved and I also own a Samsung Galaxy Tab 10.1 which is hate. The Nexus 5 has ignited at least after only a couple of days an excitement of an Android device after Samsung made me hate them. I ended up ordering the Spigen SGP Neo Hybrid - Slate because they said I'd have it by Wednesday at the latest and review videos answered concerns with regards to the case. Will let you know how quickly cbay ship and how good the case really is. It came out to 18.12 NZD after shipping. I'll report on how good it is once it gets here. I just ordered this one directly from Amazon. Spigen seem to have changed their shipping policy and allow Amazon-fulfilled deliveries into NZ. Total cost, including delivery, comes $2.50 under the cbay price. So got my case from cbay today. It was attempted delivery yesterday but I was out. So considering I did the purchase on Monday after 4pm and they still managed to get it shipped in Mondays mail with it arriving in Dunedin from Auckland the next day is pretty impressive. So big thumbs up for Cbay. The case it self is great. It's got a nice sound when you put it on a hard surface. that deadened sound that comes from the back TPU? rubber when placed on a hard surface is nice. When I shake the case the phone doesnt move at all. the only noise I can hear faintly is the volume rocker. For what it's worth, I just received my new Nexus 5 and Neo Hybrid case today. The case is very well made, but just a little bit big and slippery for my taste (YMMV). Once I find a replacement case I'll probably sell the Neo Hybrid (Slate) case at a loss on trademe if anyone's interested. I forgot to report on the case I purchased. I have been using it for a while now, and I quite like it. It adds a bit of bulk, but, it's not unbearable. I like the clear back as I'm able to just add my own image for it. It seems to have plenty of protection for both falling on its face as well as the back/corners. Overall, I like it. dauckland:I just ordered this one directly from Amazon. yeah i ended up buying 2 from ebay at a little more than 1 would have cost me locally, and only 4 days delivery.